ho said that the lakes are not appealing in Winter? Lakes could be poetic, mystic and romantic even in Winter time and especially at Christmas! 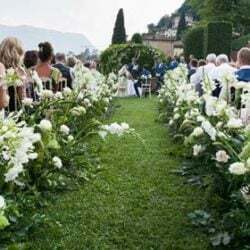 If you are planning an off season intimate winter wedding Lake Orta could be the perfect setting. 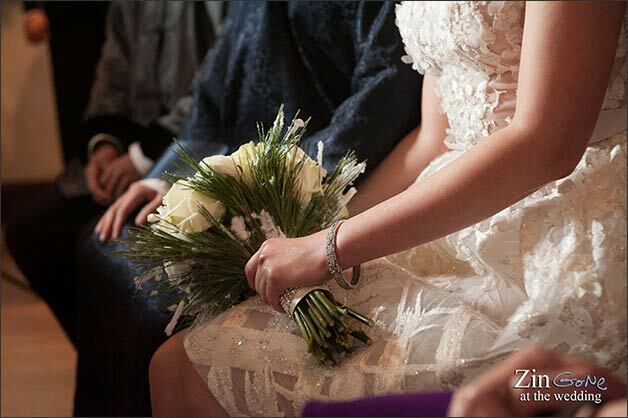 That frosty, glowing and silvery feeling you are looking for for your holiday themed wedding! Do you remember? We planned another romantic winter wedding some time ago: Barry and Novi’s wedding. 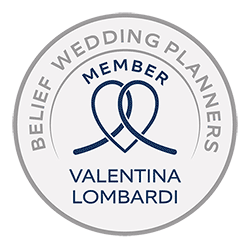 We decided to tell you about this wonderful intimate winter wedding on Lake Orta because… we are getting closer to Christmas… it could be a lovely inspiration for an unusual winter event! 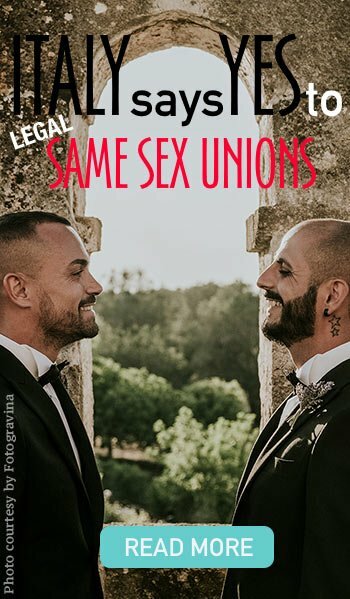 For privacy reasons we won’t mention the names of our couple and we won’t show their faces, but you can see here all details of their special events in these post thank you also to wonderful photos Alessandro Zingone Photographer took on the day. 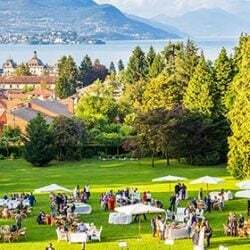 Our couple comes from China and they decided to get married for two main reasons: the beauty of the location and the presence of Villa Crespi part of famous Relais & Chateau Chain. 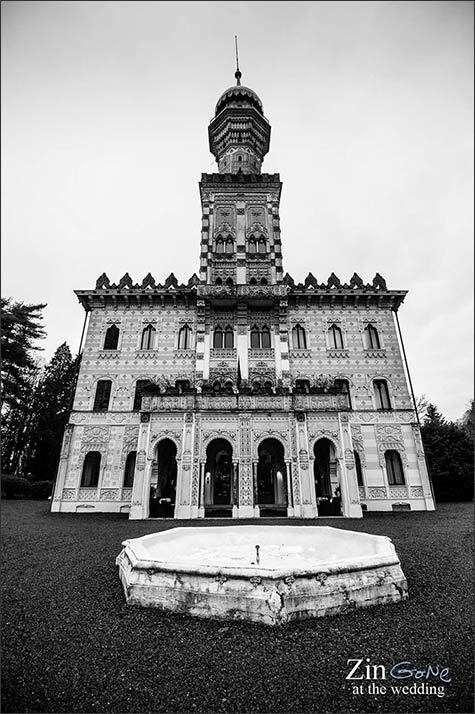 Villa Crespi is one of the most prestigious venue on Lake Orta with its amazing Moorish style rooms and 2 Michelin Stars restaurant headed by Chef Antonino Cannavacciulo. He is actually a real star. 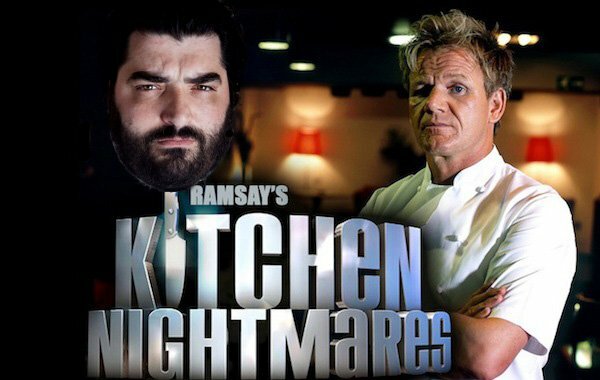 He hosts Italian version of Kitchen Nightmares, and he is a wonderful kind and friendly man coming from Southern Italy. 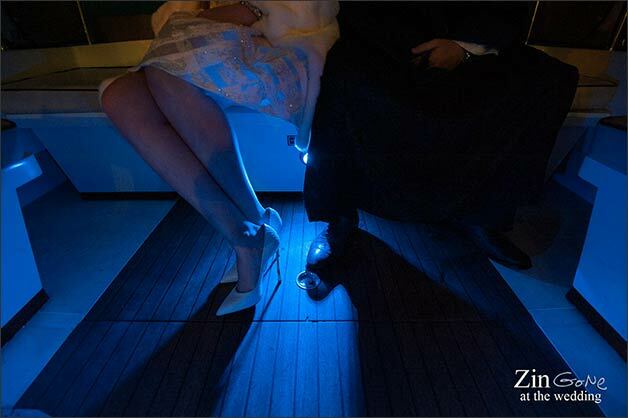 Our bride and groom invited only few guests to their special winter wedding in Italy on Lake Orta. For the occasion bride had two winter themed wedding dresses. The first one was white and short for the ceremony and the other one was ivory with sparkling details for the evening celebratory meal. 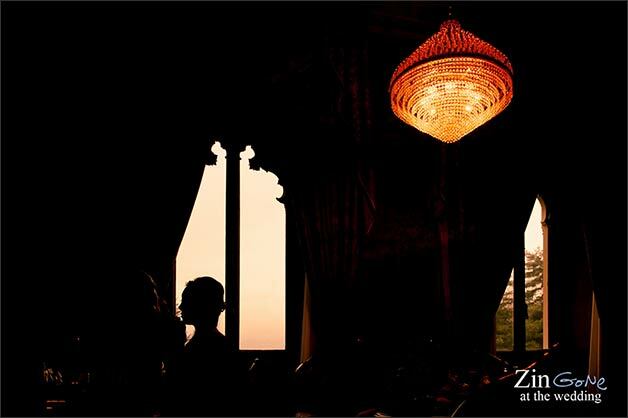 Bride groom and their guests got ready at Villa Crespi. 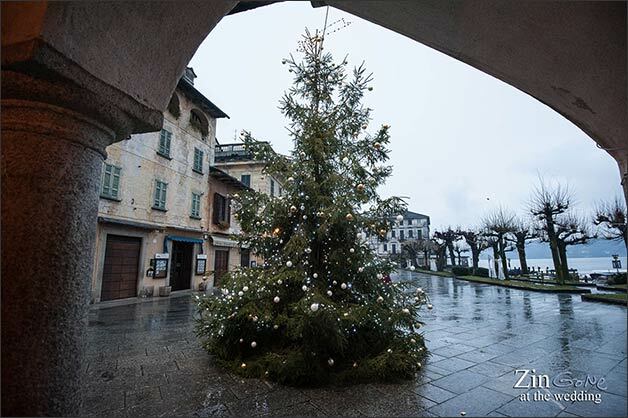 Once ready they reached Orta main square. Bride reached Orta main square by motor boat. 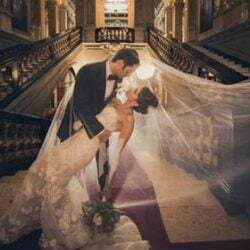 She looked like a real model in her white short wedding dress with high heels shoes and white warm fur to protect her from winter weather. 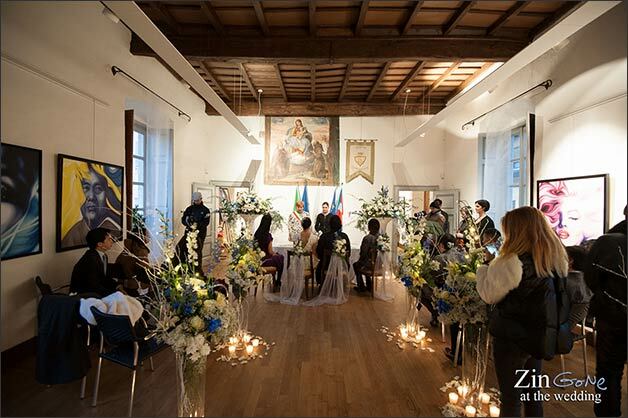 During Winter time Orta town hall prefers to celebrate civil ceremonies at Palazzotto rather than in famous Villa Bossi. It used to be the ancient town hall of the village. It was built in 1582. It has a lovely portico below and a wide room on the first floor. 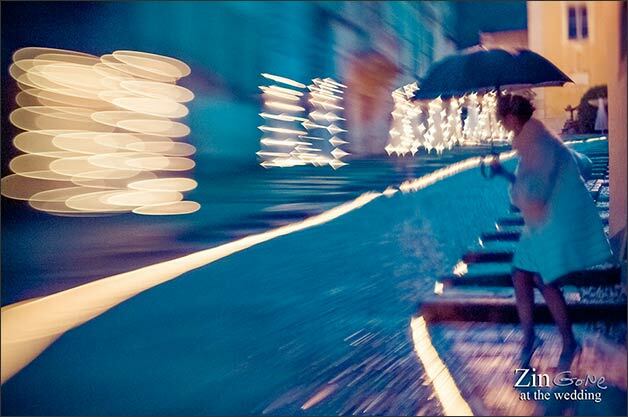 We are sure you’ve seen it many times in the pictures of our bride and groom in the main square. 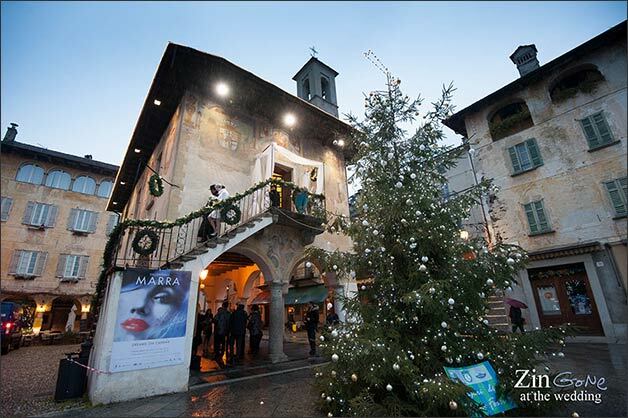 It is just here where Orta places its huge Christmas tree for the holiday season. 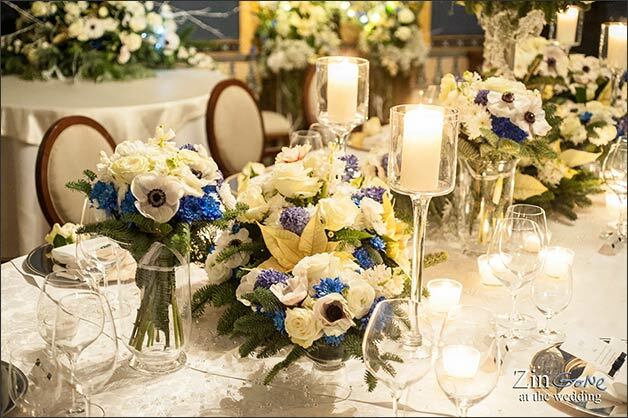 For the occasion ceremony venue at Palazzotto was decorated with tall vases with pines, roses, white frosty branches, gypsophila and a touch of blue with delphinium. 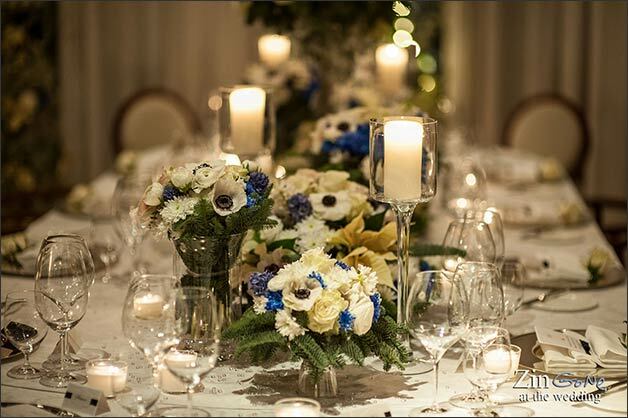 Some candles and organza fabrics added that special warmth that could be ideal for a winter wedding. Outside Palazzotto on its famous staircase there were pine garlands with some white roses on to enhance bridal arrival and recessional. After the ceremony bride and groom took some time for some special photos in Orta village. At Chrismas Orta is wonderful! 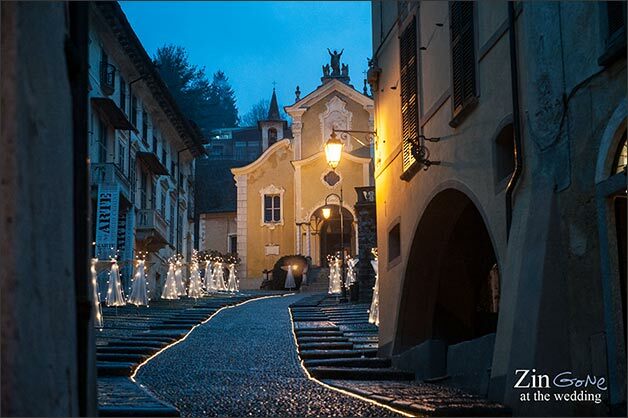 Lights everywhere and Christmas decorations all over the narrow roads make the village an enchanting nativity scenario. A boat trip on a winter sunset could one of the most romantic experience you could have in Orta during holiday season! 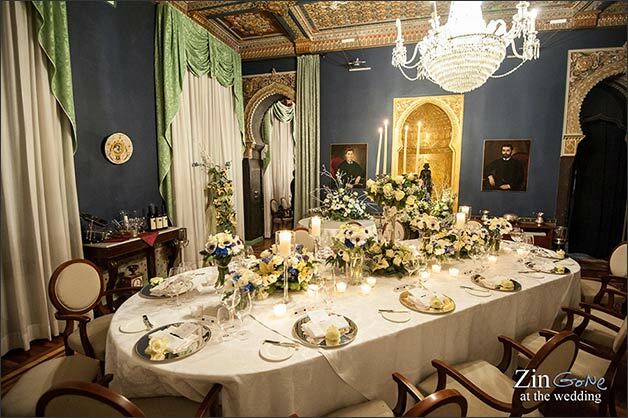 Everything was ready at Villa Crespi to welcome bride and groom and their intimate group of guests. After a tasty aperitif the gourmand dinner prepared by Chef Antonino Cannavacciulo and his staff was served. 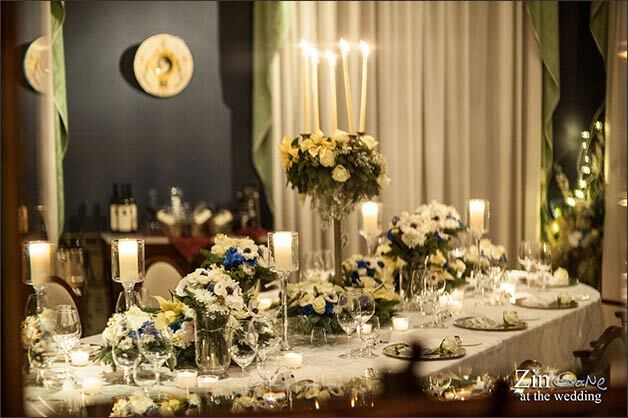 Bridal royal table was decorated for the occasion with a tall silver candelabra, glass candle holders and tea lights with warm white candles in. 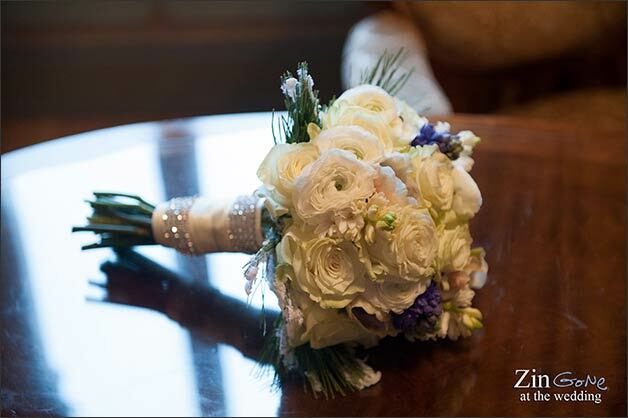 Floral composition on the table and in glass vases with roses, ranunculus, anemones and hyacinths enriched the frame. 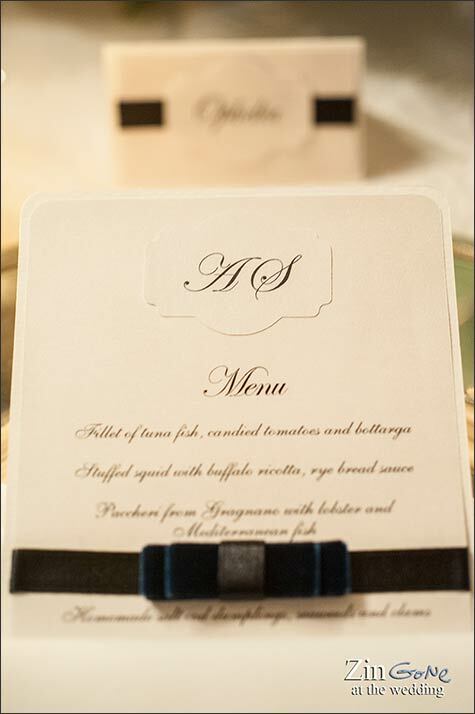 Bride choose white with deep blue velvet ribbons details for her hand made stationary on the table: names cards and menu cards perfectly matched the white blue theme she loved. A wonderful dinner everybody will remember for a long time accompanied by best Piemonte wines by Gaja. 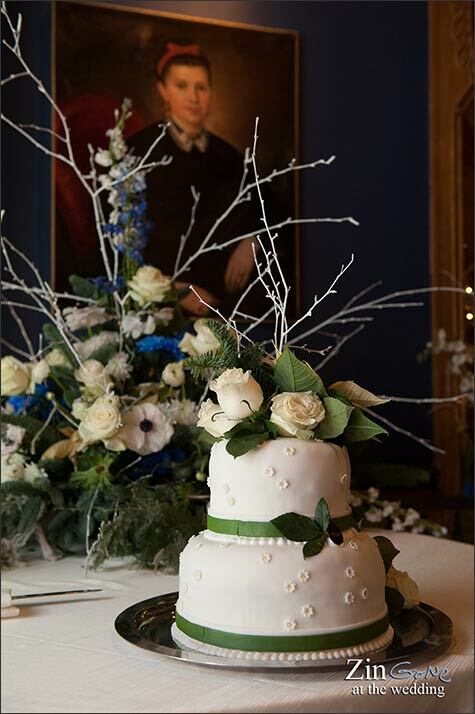 Wedding cake was prepared by Villa Crespi too. A small one, delicate winter themed wedding cake with green details and a big composition side of it with same winter flowers and some white branches to enhance this special moment. 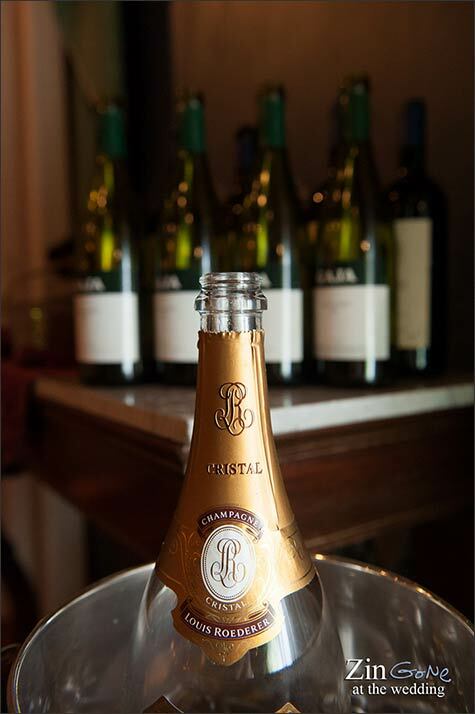 And for the toast: Cristal Champagne of course! 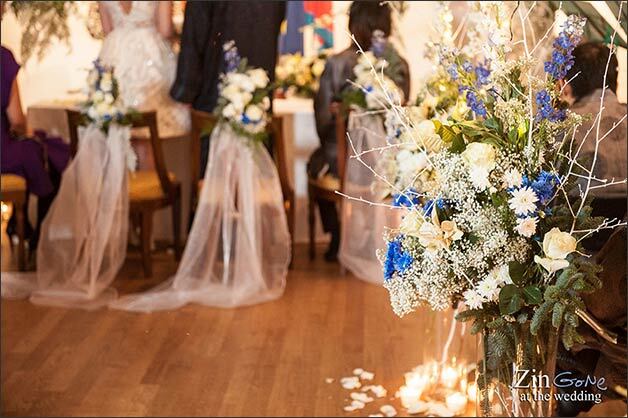 Are you looking for a special elegant and romantic Winter wedding in a charming, warm and mystic setting? 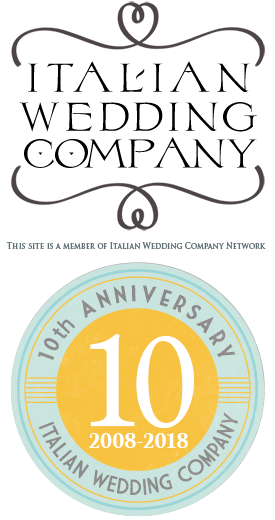 Lake Orta could be the perfect choice! 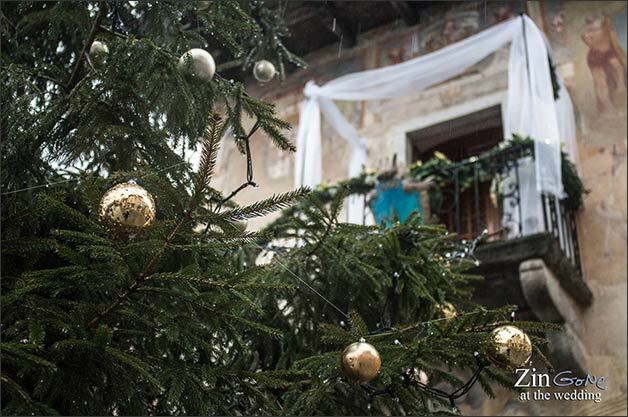 A Medieval village just for your own to make your Christmas themed wedding unforgettable.